Kids Can Save the Animals! 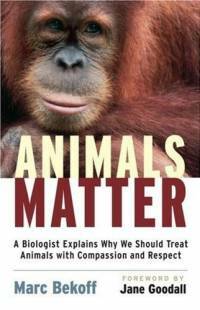 Nonhuman animals have many of the same feelings we do. They get hurt, they suffer, they are happy, and they take care of each other. Marc Bekoff, a renowned biologist and Guggenheim Fellow at the University of Colorado in Boulder, guides readers in looking at scientific research, philosophical ideas, and humane values that argue for the ethical and compassionate treatment of animals. Citing the latest scientific studies and tackling controversies with conviction, he zeroes in on the important questions, inviting reader participation with "thought experiments" and ideas for action. Bekoff urges us not only to understand and protect animals-especially those whose help we want for our research and other human needs-but to love and respect them as our fellow beings on this planet that we all want to share in peace. Marc Bekoff, PhD, a biologist who specializes in cognitive ethology (the study of animal minds) and behavioral ecology, is the author or editor of some twenty books. With Jane Goodall, he cofounded Ethologists for the Ethical Treatment of Animals. His most recent book is The Emotional Lives of Animals. "How do I Understand Animal Protection"
10/04/16 Crvena Jabuka at Veggie Picnic! 07/09/07 Author of the Book "When Elephants Weep" in Croatia! Animal Friends is a non-profit, non-governmental organization, founded in 2001 with the aim to promote animal protection and animal rights as well as veganism, as ethical, ecological and healthy lifestyle. Animal Friends Croatia is a member organization of EVU, Eurogroup for Animals, ECEAE, FFA, IAFC and OIPA. Saturday: 10 a.m. - 3 p.m., out of office hours upon agreement.